These wrestler figs had their championship belts stolen. To be fair, what wrestler doesn't have his championship belt stolen? THE ROCK WILL LAYETH THE SMACKETH DOWN ON THESE MONKEY ASSES!! HE'S GONNA TAKE THAT BIG OL SIZE 13, TURN THAT SUMBITCH SIDEWAYS, AND SHOVE IT STRAIGHT UP THEIR ROODY POO CANDY ASSES!!! IF YOU SMELL-ELELELELELELELELELELA!!! WHAT THE ROCK IS COOKIN'! In truth what a waste that toy take on this belt was. Saw a cool opp to mimmick the actual belt with swappable plates for each Elite fig that comes out. Oh well. This seems like such a weird theft. I wonder if it's actually this person's way of saying that the Rock didn't deserve to win his belts or something. Or maybe it's just a big jerk. One or the other. i don't understand why people steal the belts so often. 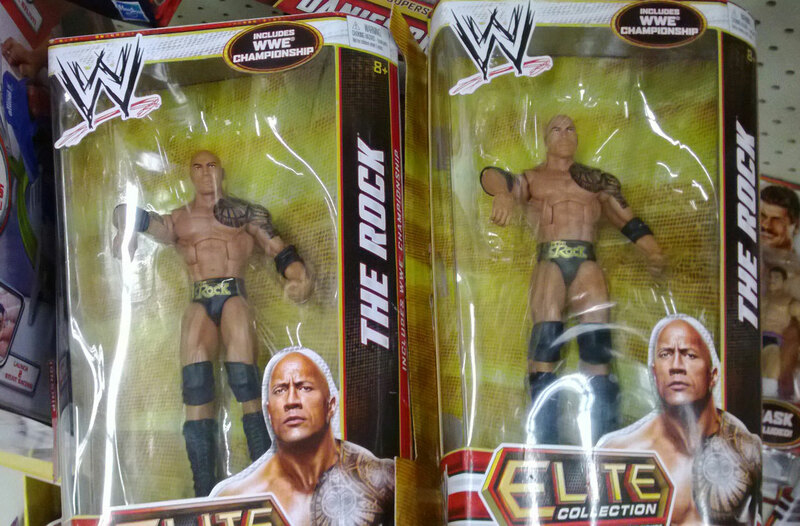 I mean, are wrestling figure collectors really such sticklers for accuracy?